Materials informatics is the next frontier of materials science, taking computational and machine learning tools and applying them to characterizing and discovering materials. A group of Colorado School of Mines students spent their summer getting a hands-on introduction to the burgeoning field, thanks to a newly expanded fellowship program. 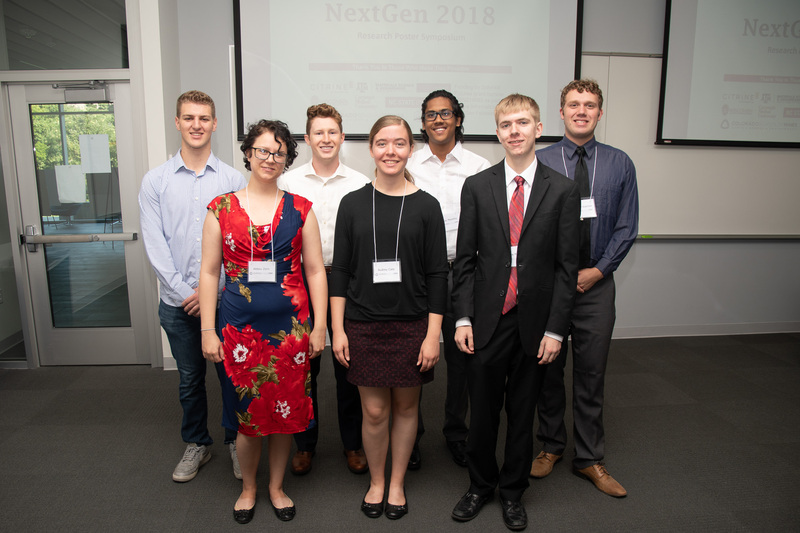 The Citrine NextGen Fellowship, with additional support from Mines’ Alliance for the Development of Additive Processing Technologies (ADAPT) and College of Engineering and Computational Sciences, supported six undergraduate students at Mines this summer – five who attend Mines and one from the University of California, Santa Barbara. The 10-week paid fellowship enabled students to conduct research on campus and provided extensive training in data management and data science as well as mentorship from Citrine Informatics’ data science and data engineering teams. The program began with a Data Bootcamp at Citrine Informatics’ Silicon Valley headquarters and ends Aug. 9 with fellows presenting their work to other researchers at a symposium at Mines’ CoorsTek Center for Applied Science and Engineering. With a $400,000 commitment from Schmidt Futures for 2018 and additional funds from the National Science Foundation, Citrine Informatics is sponsoring fellows at Mines and four other institutions across the nation this summer: University of Wisconsin-Madison, Carnegie Mellon University, North Carolina State University and Texas A&M University. Citrine Informatics was founded in 2014 to accelerate the development and use of new materials by harnessing the power of machine learning. The company funded a pilot fellowship in 2017, which paid four undergraduate fellows to conduct research while learning and utilizing the tools of the trade. “The academic community is a crucial partner in spreading the adoption of advanced analytics in materials science,” said Josh Tappan, the startup’s community manager. At Mines, the fellows are working in labs across campus, focusing on a range of research topics. Advising the students are Mechanical Engineering Associate Professor Aaron Stebner, Research Assistant Professor Branden Kappes, Assistant Professor Garritt Tucker and Professor Cristian Ciobanu; Metallurgical and Materials Engineering Associate Professors Jeff King and Kip Findley; Physics Assistant Professor Jeramy Zimmerman and Associate Professor Eric Toberer; and Computer Science Associate Professor Hua Wang. The applications of materials informatics that students are researching this summer include accelerating the analysis of atom probe tomography data collected for organic light-emitting diodes, understanding and predicting the elastic properties of layered materials to develop better thermoelectrics and conducting better pore analysis of additively manufactured alloy components. Abbey Zorn, a senior majoring in mechanical engineering, is working with Stebner and Kappes, taking X-ray computed tomography images of additively manufactured parts to create a correlation between porosity and the laser parameters used to create the part. She was drawn to materials informatics because of her minor in computer science, a field she plans to pursue as a graduate student. “I have never done research before, but Dr. Stebner is my client for my senior design project and he recommended the fellowship to me,” Zorn said. The experience has given her valuable real-world insight into how research works, she said. Applications for the 2019 Citrine NextGen Fellowship will open in February.